The NFRMPO is currently undertaking the 2045 Regional Transportation Plan (2045 RTP). The Regional Travel Demand Model is currently being updated as are the existing conditions of the region’s socioeconomic data and transportation system. Below is a current draft schedule of the adoption of the 2045 RTP. To find out how to get involved in the 2045 RTP, visit the public comment page. The North Front Range region enjoys a diverse and growing community, and a unique environment. The rapid and continued growth of the region requires that transportation investments keep up with development to maintain a vibrant economy. 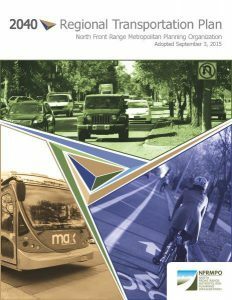 To better plan for the future of the region’s transportation system, the NFRMPO has prepared the 2040 Regional Transportation Plan (RTP). The 2040 RTP is a federally-mandated plan for Metropolitan Planning Organizations (MPOs) and includes a long-term transportation vision for the region. The 2040 RTP summarizes the existing transportation system: roadways, transit, bicycle and pedestrian infrastructure, the environment, and includes a fiscally-constrained corridor plan for the future. The 2040 RTP was amended on February 2, 2017 and June 1, 2017. View the plan at the links below, or read more about the components of the 2040 RTP. The 2040 RTP as approved on September 3, 2015 is available for download at the link below. 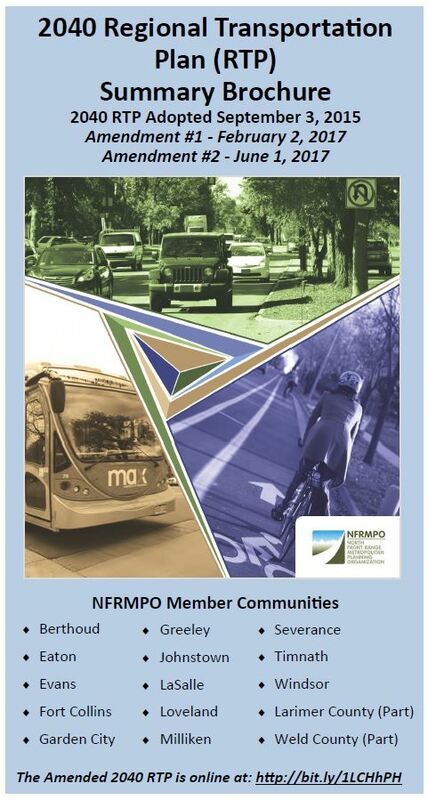 Anyone needing special accommodations to access the content of the Plan should contact the NFRMPO at staff@nfrmpo.org.